Thor Mining (LSE:THR) jumped 8.9pc to 1.15p on Tuesday after announcing plans to spin off its interest in the Kapunda copper project into a new business. The firm, which was down 6.5pc on Wednesday, has signed a memorandum of understanding (MOU) to transfer its interests in the Adelaide-based project into Enviro Copper. This new vehicle will then hold earn-in rights up to 75pc in Kapunda as well as another asset called the Moonta copper project. In exchange for transferring its stake, Thor can hold up to a 30pc position in Enviro before any listing activities. Thor shareholders, meanwhile, will hold the first option to invest in any listing that Enviro decides to seek on a recognised securities exchange. Kapunda hosts an in-situ recovery (ISR) amenable inferred mineral resource estimate of 119,000ts of contained copper. Thor holds its interest in the product through a private Australian company called Environmental Copper Recovery (ECR). Thor announced an agreement to earn up to 60pc in ECR last August in exchange for convertible loans worth up to $1.8m. ECR holds an agreement to earn, in two stages, up to 75pc of the rights over metals that may be recovered in the Kapunda deposit from ASX-listed miner Terramin. Under the Enviro MOU, Thor will relinquish its interest in ECR and buy a 25pc, pre-listing, interest in Enviro for A$0.6m. It will also hold the right to acquire a further 5pc seed capital interest in the vehicle for $0.4m. Moonta, meanwhile, is also based in Adelaide, where it sits within the historical ‘copper triangle’ of South Australia. Here, around 300,000ts of copper was mined and processed from the 1860s until the 1920s. Although it is less advanced than the Kapunda target, it contains an ISR amenable exploration target of between 238Mt and 310Mt at a grade range of 0.18pc-0.23pc copper. The asset is 75pc owned by a business called Environmental Metals Recovery, subject to due diligence. In Tuesday’s update, Thor said the new combined entity would provide a strategic opportunity to build a substantial ISR-focused copper exploration, development, and production business with an initial focus on Australia. It said a key strategic target would be the ‘timely development’ of Kapunda into production, which would demonstrate the viability of ISR. This model would then be applied to the larger scale Moonta project. Beyond its two initial interests, Enviro will aim to develop an expanded portfolio of ISR copper opportunities. Thor’s executive chairman Mick Billing added that Enviro could add ‘significant scale’ to the firm’s copper interests by bringing in exposure to Moonta. ‘While Kapunda is comparatively more advanced, the Moonta project, albeit at an earlier stage, provides potential for a much larger, and longer-term copper production entity,’ he said. The opportunity for eligible Thor Mining shareholders to have a priority investment opportunity in the new vehicle is seen as a core ingredient in the establishment and listing of this new entity. 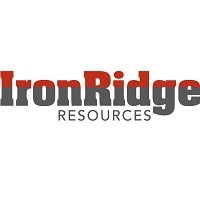 Ironridge Resources (LSE:IRR) dropped 2.5pc to 19p on Tuesday despite announcing multiple new high-grade lithium intersections at two of its site in Ghana. The firm has now received all the assay results for a 4,684m second-phase RC programme carried out at its flagship Ewoyaa project and new Abonko discovery in the West African nation. The latest round of results from drilling December showed good continuity of mineralisation along infill sections at Ewoyaa, with high-grade lithium pegmatite intersections. Highlights included 80m at 1.52pc lithium dioxide from surface including 22m at 1.76pc lithium dioxide from 52m ad 68m at 1.31pc lithium dioxide from 45m including 10m at 1.8pc lithium dioxide from 64m. The drilling programme was designed to test strike extensions and newly-defined pegmatite zones at Ewoyaa and Abonko as well as completing infilling resource drilling along two sections at Ewoyaa. Metallurgical sampling has now been completed, with sampled being sent to Nagrom in Perth for preliminary metallurgical test-work. Meanwhile, regional pitting around Ewoyaa-Abonka pegmatite clusters is ongoing, with new pegmatites and extensions continuing to be discovered. Vincent Mascolo, chief executive and managing director of IronRidge, said: ‘Drilling results continue to confirm that Ewoyaa is a significant discovery, which is high-grade and spodumene dominant; the preferred feedstock for end users. ‘Located within 100km trucking distance of an operating deep-sea port and within 1km of a bitumen highway, Ewoyaa is well positioned to benefit from existing infrastructure. In addition, the project is situated in the favourable, pro-mining jurisdiction of Ghana, which is ideal for the future development of the Cape Coast Lithium Portfolio. ‘Confirmation of grade and continuity of mineralisation between 50m spaced cross-sections within the Central Zone of the main Ewoyaa deposit is very positive and bodes well for future resource estimation, as well as simplicity of mine design and process flow-sheet. ‘Ongoing mineralisation discovery within the immediate project area, including new pegmatites at Ewoyaa and Abonko and step out drilling extending the known high-grade mineralisation at Ewoyaa an additional 250m of strike is highly encouraging. 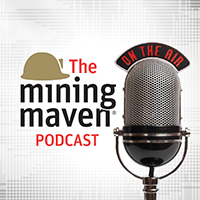 ‘The recently discovered high-grade spodumene dominant pegmatites at Abonko, and around Ewoyaa, is significant as it adds further resource scale potential. Field teams have finalised metallurgical sampling, with 427kg of diamond drill core being dispatched to Nagrom laboratory in Perth for preliminary metallurgical test-work with initial results expected in the coming months. 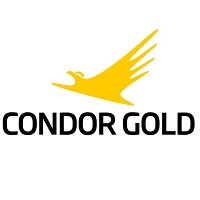 Condor Gold (LSE:CNR) bounced 7.2pc to 23.6p on Tuesday morning after revealing that it has started permitting for two feeder pits at its La India project in Nicaragua. The gold exploration and development business said America and Mestiza could increase open pit production at the asset by 50pc to 120,000oz of gold p.a. for seven years. The pits have, in aggregate, 206,000ts containing 66,0000oz gold in the indicated category and 152,000oz contained gold in the inferred category. They are located between 2-4km from the location of the processing plant for the La India open pit. This has now been permitted with a processing capacity of 2,800ts a day. In Tuesday’s update, the firm said it has received the terms of reference to produce an environmental impact assessment for the pit from the Ministry of Environment and Natural Resources (MARENA). This supports the granting of an environmental permit for the development and extraction of contained gold at both sites. The granting comes after MARENA, together with the Ministry of Energy and Mines and Ministry of Forestry, has conducted a site visit inspection of the proposed layout of the pits, waste dumps, and infrastructure. Tuesday’s development comes after several weeks after Condor announced an updated mineral resource estimate for La India, where it owns a 100pc position. This gave the project a mineral resource estimate of 9.85Mts at 3.6g/t gold for 1.14MMoz gold in the indicated and 8.48Mts at 4.3 g/t gold for 1.179oz in the inferred category. On Tuesday, Condor said that permitting additional high-grade open pit material at America and Mestiza would help to boost these figures and extend La India’s annual production or its life of mine. Condor chairman and chief executive officer, Mark Child, added: ‘Permitting the high grade Mestiza and America satellite feeder pits has the potential to increase annual production from open pit material by 50% to 120,000 oz gold p.a. for a seven year life of mine. The feeder pits have in aggregate 206 thousand tonnes ("Kt") at a grade of 9.9 g/t (66,000 oz contained metal) in the Indicated category and 1,018Kt at 4.6 g/t (152,000 oz contained gold in the Inferred category). Emmerson (LSE:EML) soared 16.1pc to 3.6p on Monday morning after announcing that it could significantly cut the capex requirements of its Khemisset potash project by using a different port. The business said it could save $7.5m on the capex costs previously announced in a scoping study for its Morocco-based asset by using storage and loading facilities at the Port of Casablanca. It has previously been looking at using the Port of Mohammedia for the export of potash created at Khemisset. The change in port would result in a slight increase in transport distance for the product, given the potential use of rail rather than trucks for the majority of the journey. Transport can often be a particularly expensive stage in the creation and delivery of potash due to the produc’s bulk and heaviness. However, in Monday’s update, Emmerson said indicative mine-to-port logistics cost quotes from the Moroccan National Rail Company show no change in operating costs from Khemisset’s scoping study. The business added that using Casablanca, a significantly larger port with a more significant draft capacity, would allow the loading of a broader range of vessel sizes. This has the potential to reduce overall bulk shipping costs to target markets like Brazil, it added. Elsewhere, the company said it remains in discussions with numerous Moroccan entities, included the port authorities. It is looking at further opportunities to improve Khemisset’s economics ahead of upcoming feasibility studies. The scoping study for Khemisset confirmed that it has the potential to be among the lowest capital cost, highest margin potash projects in the world. Forecast economics include EBITDA margins of more than 60pc and a post-tax NPV10 of over US$1.1bn based on industry expert price forecasts. Emmerson’s chief executive Hayden Locke said it was ‘pleasing’ to see progress in the firm’s efforts to cut costs at Khemisset. ‘The Port of Casablanca is one of the largest and most modern in Africa and, consequently, it has outstanding infrastructure already in place. Discussions with the Port Authority suggest that we may be able to benefit from this; potentially reducing our capital costs further and having a net positive impact on our overall transport and logistics costs delivered to our target markets, including Brazil. ‘This is a positive development and it will form a key part of our analysis for the Feasibility Study. We are rapidly progressing Khemisset and look forward to keeping shareholders updated as we identify further areas of improvement for the Project during 2019." Towards the end of last month, the firm hired Don Larmour of Global Potash Solutions to advise on metallurgy and processing at the asset as well as acting as a consultant for the feasibility study. Larmour has already conducted a detailed review of the Khemisset scoping study as part of his hiring process. Through this, he identified opportunities for the simplification and optimisation of the project’s design. Emmerson believes these have the potential to reduce capital and operating costs. He also suggested potential changes to Khemisset’s brine management strategy and identified several areas of focus for the next, more detailed design phase to further de-risk the project. In an announcement Thursday, Oriole Resources (LSE:ORR) disclosed that IAMGOLD is about to restart exploration at the Dalafin gold project in Senegal. IAMGOLD is progressing into the second year of its earn-in to the project with a budget of $1m. Oriole currently owns an 85pc interest in Dalafin and the firm has provided IAMGOLD with an option to earn-in to an initial 51pc interest with a $4m spend over four years progressing the project. IAMGOLD can further extend its interest to 70pc with an additional $4m spend over the following two years. The exploration programme will continue to focus on Madina Bafé and will include 5,000m of regional aircore (AC) drilling, to extend the previous 2018 campaign and 4,000m reverse circulation (RC) drilling to follow-up on the best results from last years drilling. Then focus will turn to the Saroudia prospect situated 2km away with 2,500m regional AC drilling and RC drilling will follow at the best locations. Oriole expects results will be available towards the end of the second quarter or early in Q3 this year. The Dalafin licence is located in the Birimian-age Kédougou-Kenieba gold belt that extends from eastern Senegal into western Mali and has already seen multiple major gold discoveries including Randgold Resources’ Massawa deposit which is estimated to contain 3.4 million ounces of gold. four main geochemical targets, Faré, Baytilaye, Saroudia, and Madina Bafé, have been identified to date. Oriole Resources CEO, Tim Livesey, said: "We are delighted to announce that IAMGOLD has committed to its year two earn-in on the Dalafin licence following an initial successful drilling programme last year. 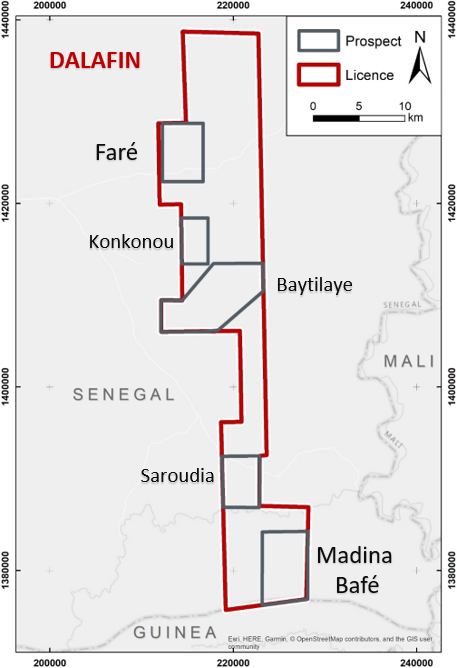 The exploration programme outlined will continue to build on the exciting results already delivered at the Madina Bafé prospect with additional drilling planned for the Saroudia prospect to the North-West. Our partnership with IAMGOLD at Dalafin has already contributed significantly to the increasing value of Oriole's wider portfolio, and we look forward to updating the market on this stage of the drilling programme later on in the year." Cora Gold (LSE:CORA) released drilling results from its Sanankoro gold discovery on Tuesday. The company said drill results from the Zone A prospect showed ‘good correlation to historical drilling’. Sanankoro is Cora’s flagship project and is situated in the Yanfolila Gold Belt in Southern Mali. The firm believes the project has the potential for a standalone mine development and is in the process of determining the location of higher grade areas with the current drilling campaign. Cora reports that this first set of drilling results suggests a continuation of broad zones of shallow high-grade mineralisation across the Zone A prospect. All holes ended in oxidised material to depths of around 90 metres. The drill results (shown below) include a number of higher-grade areas with top examples of 8m at 3.17g/t Au from 69m and 26m at 2.60 g/t Au from 71m. "These initial results from our latest drill programme are particularly encouraging. The results reported from the Zone A prospect vindicate our strategy of focusing on oxide deposit areas that have the potential to become higher grade starter pits for a future development opportunity. 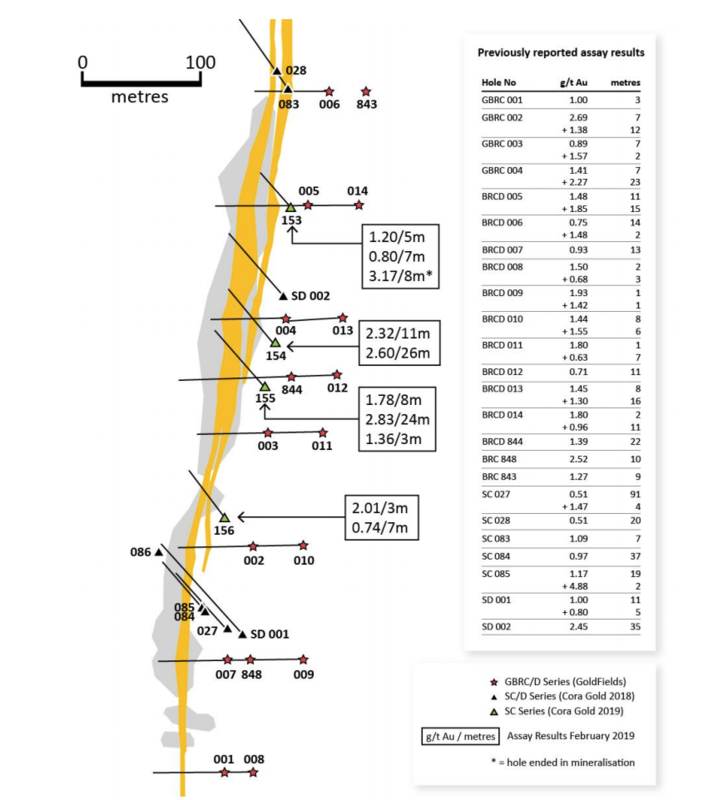 The continuity of the widths, grades and near surface location of the gold mineralisation is potentially indicative of a zone that is in the 'sweet spot' with potential for future economic extraction; in particular given the very deep weathering that has resulted in oxidation to depths of 90m or more." In October, Cora announced that SRK Consulting had determined an initial Exploration Target of between 30 and 50 million tonnes of gold ore at a grade of between 1.0 and 1.3 g/t Au at Sanankoro. The company believe there is the potential to delineate 1-2 million ounces of gold to a depth of 100m. Last month the firm appointed Wardell Armstrong International (WAI) as independent consultants to undertake a preliminary metallurgical test work programme at Sanankoro in order to assess the amenability for cyanide leach extraction of gold from oxide mineralization at the discovery. A core hole has now been drilled to provide a composite oxide metallurgical sample for the metallurgical test work programme. Prairie Mining (LSE:PDZ) declined 7.1pc to 19.5p on Tuesday morning after announcing a six-month extension to discussions around a potential deal on its Polish coal projects. Prairie and major coal miner Jastrzębska Spółka Węglowa (JSW) have signed an agreement to extend the terms of a non-disclosure agreement (NDA) related to a potential co-operation arrangement until 28 September 2019. The possible link-up was first announced last March and saw Prairie give JSW access to information on its hard coking coal project under the Debiensko-1 concession and its Jan Karski project in the Lublin Coal Basin. JSW has since been conducting an assessment of the feasibility and economics offered by both projects. This has now completed and has confirmed that Jan Karski’s Lublin deposit contains semi-soft coking coal that it can potentially utilise. JSW’s work has also shown the technical feasibility and potential synergies of accessing initial seams at the Dębieńsko deposit. This would employ existing infrastructure at JSW's adjacent Knurów-Szczygłowice mine and potentially enable the production of hard coking coal within 18 months of permits being granted. In Tuesday’s update, Prairie said the NDA has been extended for the ‘purposes of continuing discussions’. It added that the firms would discuss a potential deal structure and commercial terms for any co-operation or transaction. They will also look at developing the existing mine plans for both projects to fit in with JSW’s plans. Jan Karski is a large scale semi-soft coking coal project located in the Lublin Coal Basin in south-east Poland. It is situated adjacent to the Bogdanka coal mine, which has been in commercial production since 1982 and is the lowest cost hard coal producer in Europe. According to Prairie, Jan Karski has the potential to produce a high-value ultra-low ash semi-soft coking coal with a coking coal product split of up to 75pc. Meanwhile, the Debiensko nine is a hard-coking coal project located in the Upper Silesian Coal Basin in the south west of Poland. The firm added that any transaction will be subject to conditions like obtaining positive evaluations and expert opinions, necessary corporate approvals, consents and approvals related to funding. It also said it may also have to get consent from Poland’s competition authority and meet any other requirements that may relate to the strategy, objectives and regulatory regimes applicable to the respective issuers. These terms were once again referred to in Tuesday’s update. Kavango Resources (LSE:KAV) was trading down slightly at 3.2p on Monday morning after launching a £500,000 placing to accelerate its exploration work in Botswana. The firm placed c.17.9m shares at 2.8p each, a premium to the 2.5p it raised at when it entered the London market last July. Kavango holds 15 prospecting licences covering 9,231km2 of ground in Botswana, including most of the 450km long Kalahari Suture Zone (KSZ) magnetic anomaly in the southwest of the country. Here, the business is exploring for copper, nickel, and platinum group element-rich sulphide orebodies. The area is yet to be examined using modern drilling techniques. However, Kavango argues that it has a similar geological setting to the giant Norilsk copper/nickel deposits in Siberia. In Monday’s update, chief executive Michael Foster said the proceeds from the placing will allow Kavango to accelerate its exploration programme on the KSZ. At the end of January, the business announced that it plans to begin an initial 1,000m drill programme at its Ditau project on the anomaly this month. This is designed to intersect two ‘very compelling’ coincident geophysical and geochemical base metal conductor/anomalies. Elsewhere, the firm has mobilised the second phase of an airborne electromagnetic survey over its 15 prospecting licences in the KSZ. The airborne EM survey is the first stage in the company’s efforts to identify sulphide orebodies. It detects and prioritises potential locations for these deposits, which Kavango can then follow up with more detailed groundwork and drilling. Flying for the second phase of the survey is expected to take between four to six weeks to complete and will cover up to 2,062 line-kilometres in the Hukunstsi area of Botswana. On Monday, Foster said: ‘Our current exploration programme in Botswana is on track, with both the airborne electromagnetic (AEM) survey (see RNS dated 21 January 2019) and the drilling at Ditau, which forms part of the KSZ project (see RNS dated 28 January 2019) progressing according to plan. Further information is expected to be available shortly on both these programmes which the Company will of course relay to the market at that time’. It is also worth noting that each placed share also has a warrant attached. This is exercisable at 12p from the earlier of the date falling one year after the time of admission or the date of the publication of a prospectus until 31 July 2020. What’s more, if exercised, the warrant gives the holder the right to an additional half-warrant exercisable at 24p before 31 July 2022. This ambitious target will likely send out a positive message to investors regarding management’s belief in where Kavango could be heading over the medium term. Horizonte Minerals (LSE:HZM) said ‘multiple value drivers’ will provide an exciting year ahead for shareholders in an update on Thursday. The nickel-focused firm is currently developing two projects in Brazil, the Araguaia Ferronickel Project and a nickel-cobalt project called Vermelho. Horizonte released a feasibility study for the Araguaia Project back in October last year. Based on an average nickel price of $14k per tonne, the company forecasts Araguaia could generate free cash flow of up to $1.6bn over an initial 28-year mine life. Last month, Horizonte received the construction license permitting it to construct a rotary kiln electric furnace processing plant and all associated infrastructure. Meanwhile, a pre-feasibility study is underway at the Vermelho nickel-cobalt project which the company acquired in 2018. The previous owner, Vale previously completed a feasibility study on the project which was originally scheduled for construction in 2006. What made Vermelho so attractive to Horizonte is its proximity to Araguaia. The two projects are 100pc owned by the company and combined offer a potential nickel production of 40-50k tonnes annually. Operations are underway to demonstrate the economic viability of the project which will then feed into the pre-feasibility study. The company is very bullish on the nickel market highlighting that inventories on the London Metal Exchange are at their lowest level for five years. Horizonte cites increasing demand from the stainless-steel market as well as the electric vehicle battery sector for the buoyant demand. At the time of writing the nickel spot price is around $12,800 per tonne. Many of the larger banks, including UBS and Morgan Stanley are predicting a price hike for nickel over the next few years, forecasting prices in the region of $16,500-$17,600 per tonne in 2021. Martin commented: "Work recently commenced on the PFS for our Vermelho nickel cobalt project. Snowden Mining Industry Consultants have been contracted to produce the mining schedules and act as overall study manager, in addition the Simulus Group based in Perth will provide detailed design information and costings for the Vermelho process flow sheet and together with our local Brazilian engineering partners, will deliver associated infrastructure to the project. In parallel we have our teams working on the environmental and social permitting, and new terms of reference have been submitted to SEMAS, the Brazilian Pará State Environmental Agency to advance Vermelho's Environmental Impact Assessment. "Horizonte holds two Tier 1 assets in terms of size and grade; the development-ready Araguaia ferronickel project and the Vermelho nickel-cobalt project. Our portfolio is therefore well placed at a time when demand in stainless steel and electric vehicle markets is increasing and outstripping new nickel supply coming online. "2019 is set to be an exciting year for the Company with multiple value drivers for shareholders all set against a positive back drop of the broader nickel market and growing Brazilian economy." Thursday saw Arc Minerals (LSE:ARCM) announce the sale of one of its non-core assets to help support the accelerated development of its Zamsort copper-cobalt project. The resources firm sat at 3.1p after offloading its 18.5pc position in Andiamo Exploration for $250,000. The sale to a private business called Emerald will close next Monday. Executive chairman Nick von Schirnding said the proceeds would go towards the company’s current exploration programme at Zamsort. Arc owns a 66pc equity interest in Zamsort, together with a convertible loan that converts into an additional 5pc position. The firm is planning to accelerate its drilling of Cheyeza West and Lumbeta- two large new targets identified at Zamsort earlier this month. Lumbeta stretches for 11km and is associated with the crest of a fold. Arc has previously said that these hinge points in a folded environment could act as mineralisation traps and form high-grade deposits. Cheyeza West, meanwhile, is a core 3km by 3km anomaly outlined by very high copper values in the soils enclosed by the wider 10km x 8km anomaly. The prospect is roughly ten times the size of Kalaba, currently Arc’s most developed prospect at Zamsort. With this in mind, Arc has previously described the candidate as a potential game-changer that has exceeded all of its expectations. Alongside the proceeds from the sale of its stake in Andiamo, Arc carried out a private £2.2m placement over the weekend at 3p a share to support the accelerated drilling at the two prospects. This was supported heavily by the organisation’s board and two large family offices. Elsewhere, Arc is continuing to complete an 11,000m diamond and reverse circulation drilling programme at Kalaba as well as completing a commercial-scale demonstration plant. In Thursday’s update, von Schirnding said the sale of Andiamo represents a ‘step forward’ in Arc’s plans to sell off its non-core assets. ‘We are also progressing discussions with a number of interested third parties in respect of our other non-core assets,’ he added. These assets include the business’s wholly-owned Šturec project in Slovakia, which hosts the 1.3Moz AuEq PFS stage Ṧturec Gold Project. Elsewhere on Thursday, Arc announced that Zaco Investments has now acquired a 464.69km2 area of Zamsort Mining that it is not being prioritised or developed in the near-term. The sale, first announced in Arc’s December results, has arisen to allow the business to comply with Zambian mining regulations. Arc is Zaco’s largest shareholder with a 42.5pc interest, and von Schirnding has been appointed the vehicle’s chairman. Arc said the company is now evaluating a range of options including bringing in a joint venture partner to develop the license area.